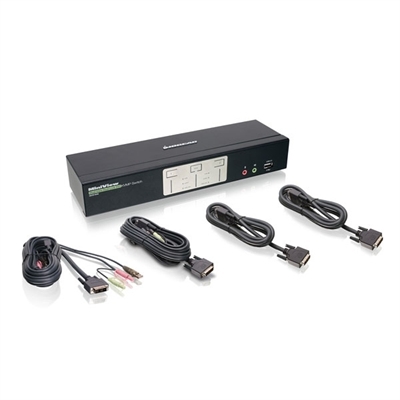 IOGEAR's GCS1642 2-Port Dual View DVI KVMP Switch marks a leap in KVM functionality by combining IOGEAR's DynaSync with the widescreen graphics resolution of today's 30+ inch monitors, supporting Dual View / Dual Link DVI, 2560 x 1600 (higher than 1080p HD). Two Dual-View / Dual Link display computers can be accessed and controlled from a single console running dual-displays. • And High-End Gaming, where high and ultra-high video resolution is demanded. The GCS1642 also features two USB 2.0 peripheral ports for asynchronously sharing USB devices between your computers. A powered USB hub may be attached to the peripheral ports for added functionality. Audio and microphone support makes sharing speakers and a microphone a convenience for the users which serves as an extra value. The IOGEAR's DynaSync remembers your monitor's ideal resolution and refresh rate (EDID), making it possible to boot all your computers simultaneously, switch back and forth between computers, and still maintain the ideal video settings of the monitor.